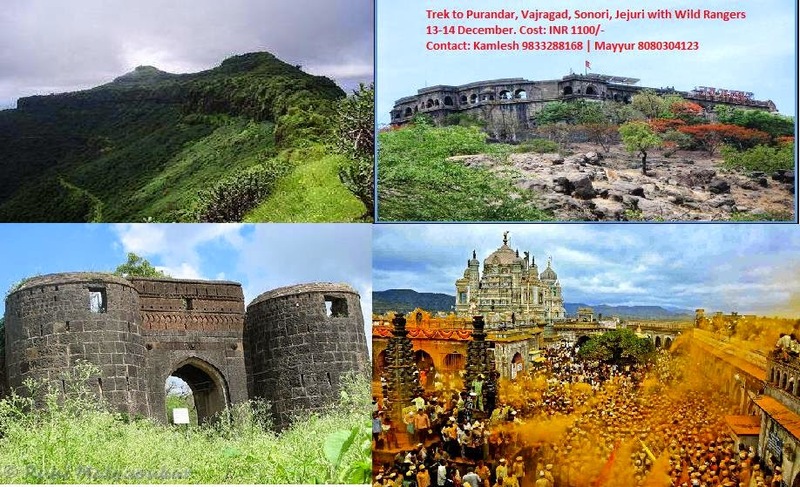 Wild Rangers, has arranged Trek to Purandar – Vajragad, Malhargad and Jejuri near Saswad, Pune on 13-14 December 2014. PURANDAR: The fort, being quite a huge one was a good place for defense. It had the capacity to house many soldier-troops, foods grains and ammunition which proved sufficient for long durations during wartime. Nonetheless, the fort hosts strong fortified places from which a watchful eye can be kept over surrounding area. The history of the Purandar fort goes back to the 13th century. The Bahamani Sultans in the 14th century built here some walls and bastions. From 1484 AD, for about a hundred years, the fort remained in the hands of the Nizamshahi rulers. In 1596 AD, the fort was given as Jagir to Maloji Bhosale, grandfather of Shivaji. However, Shivaji had to struggle very hard to establish his control over the fort in 1646 AD. In 1665 AD, Purandar was besieged by the Mughal forces under the command of Jai Singh and Dilir Khan. In the ensuing battle Murar Baji Prabhu, the gallant commander of the fort, was killed. Shivaji, under a treaty, had to surrender to the Mughals his 23 forts, including Purandar and Vajragarh. At the lower fort a statue of Murar Baji Prabhu has been installed in his memory. Purandar was recaptured by Shivaji in 1670 AD Later it became a favourite retreat of the Peshwas. Purandar was captured by the British in 1818 AD. During the Second World War, the British kept here the German war prisoners. Dr. H. Goetz, one of the German prisoners, thoroughly studied Purandar and wrote a monograph on it. Maharaj’s son, Sambhaji, was born on Vaishakh Shudhha 12, Shake’ 1579, ie., 16th May 1657, Thursday on this fort. 11:45 Hrs :- Reach Sonori (Base village of Malhargad/ Sonori Fort) by hired Vehicle. Fort exploration till 14:15 Hrs. 15:00 Hrs :- Back to base village Sonori. Start towards Jejuri. 16:30 Hrs :- Reach Jejuri. Fort Exploration of Purandar & Vajragad till 1330. 16:30 Hrs :- Reach Base village Move towards Swargate via Saswad. Travel from Swargate to Swargate by ST bus / Tumtum. Accomodation at Jejuri in locals homestay. One needs to deposit Indian Rupees 500/- into the following bank account to confirm registration.